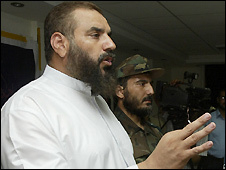 Nizar Rayyan, a key Hamas leader, has been killed by Israeli air attack in Gaza. New York Daily news writers in Gaza reported that Hamas vowed to fight “until the last breath.” Ordinary Palestinian citizens in Gaza City – where there is no power or water – braced for an invasion. Bread lines and funeral marches were the only signs of life in the normally crowded streets on the first day of the new year, 2009. According to CNN, Palestinian medical sources said 400 people have been killed in Gaza since the Israeli raids began Saturday, with 42 children, 13 women and two medical workers among the dead. In addition, 2,000 have been wounded, 216 critically, they said. You are currently browsing the archives for the Nizar Rayyan category.